My 5th consecutive rodeo since 2013. 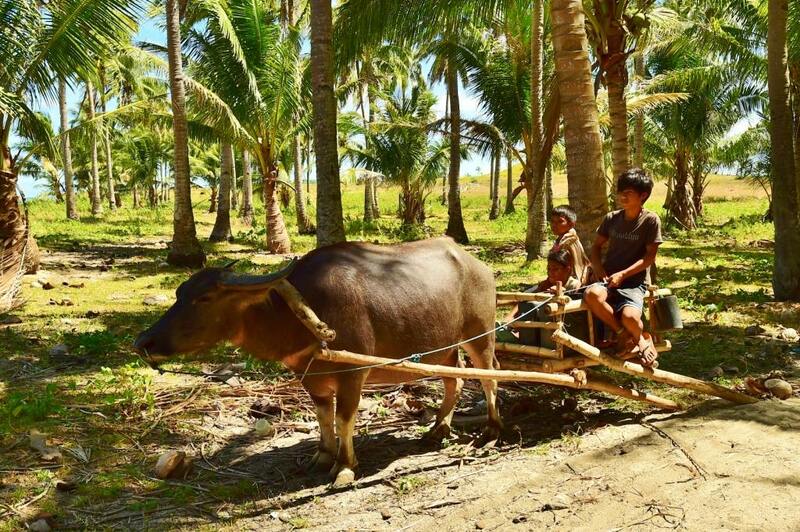 This year, the provincial government decided to give away cattle to people who can catch them on the streets of Masbate, calling the event Huego de Toro, or Pasuwag. Locals enlisted to join and were thoroughly briefed as the game is quite dangerous – – especially for onlookers. Imagine cattle that have never left the ranch being brought to the city streets for the first time The rodeo director even described the cows as blind and wild. Photographers were asked to secure themselves on spots where the cattle can not jump to. Or else their expensive gears could be damaged. professional cowboys were also around to restrain the cattle to prevent them from hammering into the crowds watching the exciting event. Establishments closed their doors in the meantime. This is bringing the rodeo into the streets ! 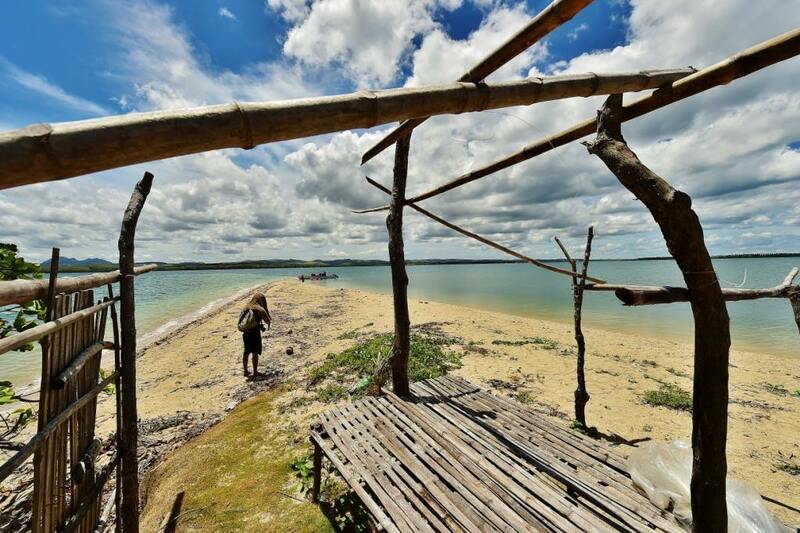 A makeshift pen was built at the end of the road from where the cattle were to be released. Another pen was built on the other end where the caught cattle will be brought by the teams. each team was limited to 3 cowboys. When they catch anything, they get to own the head of cattle. Either they bring these home for meat or sell to willing buyers. The usual cattle events participated in by professional cowboys and cowboys/cowgirls forming school teams from all over the country were played at the arena. Gotcha ! The team that holds a cows neck “owns” the cattle for the game. When properly roped in, the cowboys (and cowgirls) maneuver to cast the cattle down. And the cattle can’t go away ! Rodeo Masbateno continues to be the premier rodeo event in the country. 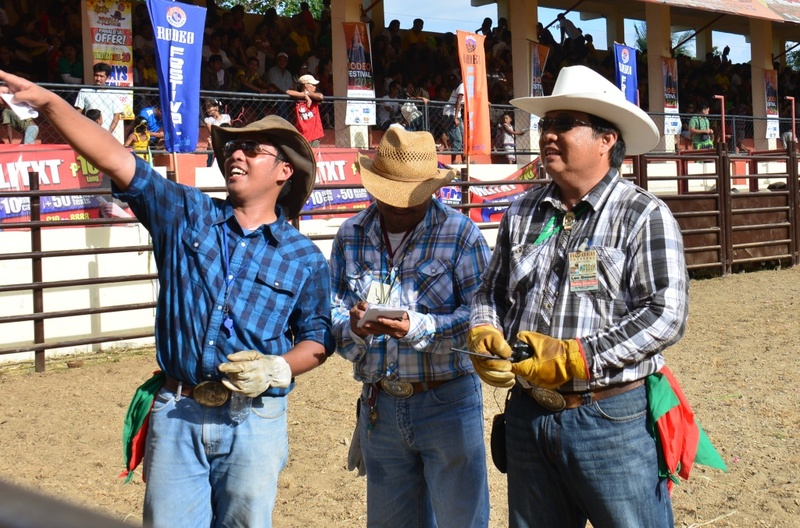 In fact, VROoM (Volunteer Rodeo Officials of Masbate) officiates other rodeo events outside of Masbate, by special arrangement. The thrill is unparalleled. Plan your rodeo experience – – – April 2018. Watch this space. 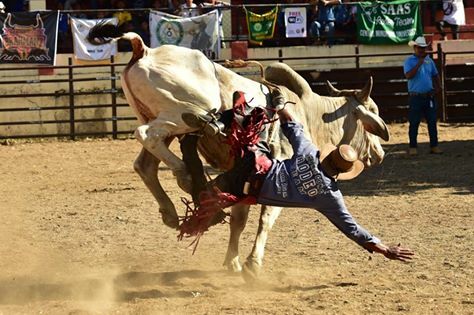 The most exciting National Rodeo Finals is ongoing at the Masbate Grand Arena, with Awards night on the 16th. I have been attending the festival for three years in a row, and I have booked my flight and my hotel for this year, too. 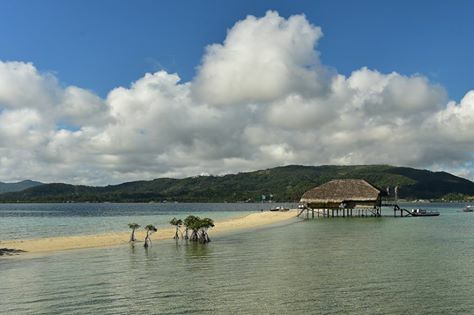 Some friends are saying they will be in Masbate for up to 3 weeks, finding the rodeo week a rather short period to truly enjoy Masbate. 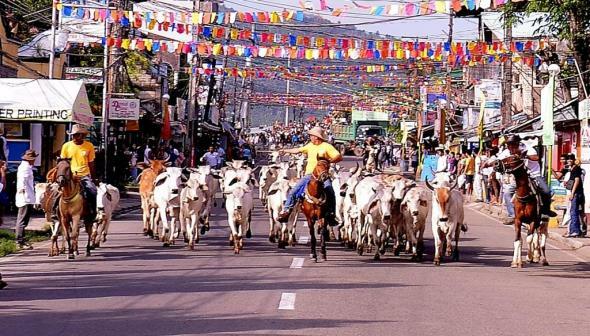 Yes, Masbate is the Rodeo Capital of the Philippines, and hosts the biggest rodeo event in the Philippines. maybe even the biggest in all of Asia. 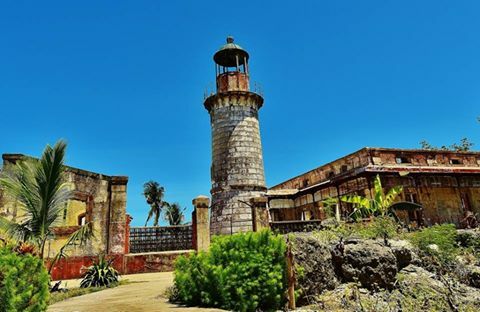 And on top of the rodeo, visitors will find side-trips to be so rewarding, seeing waterfalls, white sand beaches, centuries-old lighthouses, and many more attractions. First of all, the Rodeo. 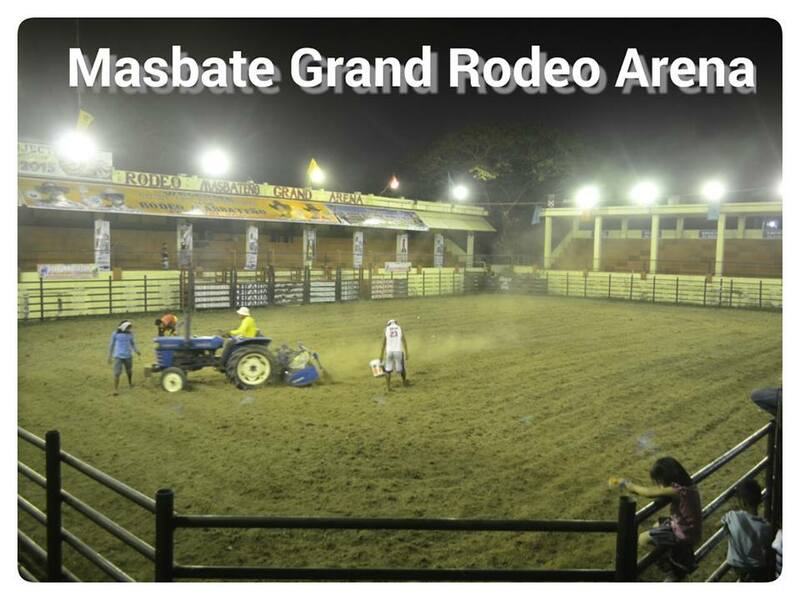 Masbate has the only proper rodeo arena in the country. Whereas all the rodeos I have visited make do with bamboo to fence off the arena, and some with GI pipes temporarily welded, Masbate has sturdy fences, a proper stage, bleachers, and a stand for the rodeo officials. There is also a canteen, and a medical facility, plus a whole complement of Red Cross volunteers. There is also a proper stockyard where the cattle is kept, supervised by veterinarians to make sure the cattle are properly handled, properly fed. The event started with a parade around the city to the arena. Participants from the competing teams from all over the country, professionals and students taking vet-med or other agri-animal related courses join officials and ranch owners as they walk or ride horses to the arena. This year, there were Manila based personalities like Congressman Roman Romulo, Congressman Sherwin Gatchalian, Ms Risa Hontiveros, broadcast journalist Korina Sanchez-Roxas, and guests of honor Mr Andre Kahn, chairman and owner of ad agency J Romeo, and Monette Ituralde Hamlin of Team Asia. 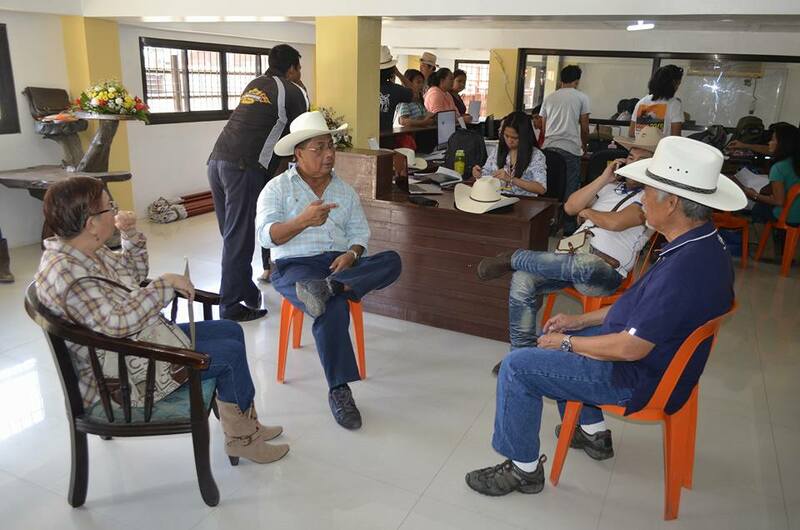 The city mayor, the Congressman from the third district of Masbate, town mayors from around Masbate City, and the provincial Governor Vince Revil plus his wife, Vice Governor Kaye Revil came in full force, in cowboy get up. Truly cowboy country. Opening ceremonies were held, including a ceremonial cattle branding led by Rodeo Masbateno Inc. President Judge Manuel Sese and the guests. An exhibition bull riding and casting down events came thereafter. The real games begin in the afternoon. 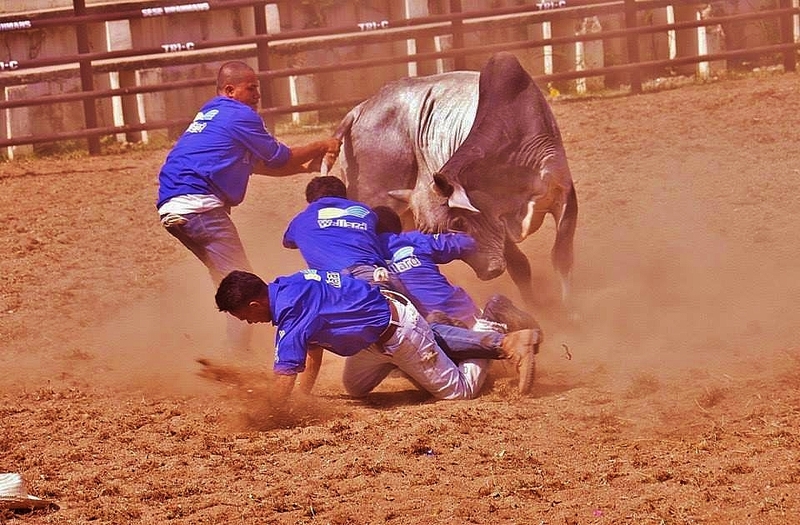 I have yet to take photos of the 2016 games – – – meanwhile I have posted photos I took from previous rodeos in Masbate to give you a glimpse of what to expect. On Day 2, the traditional Cattle Drive begins. 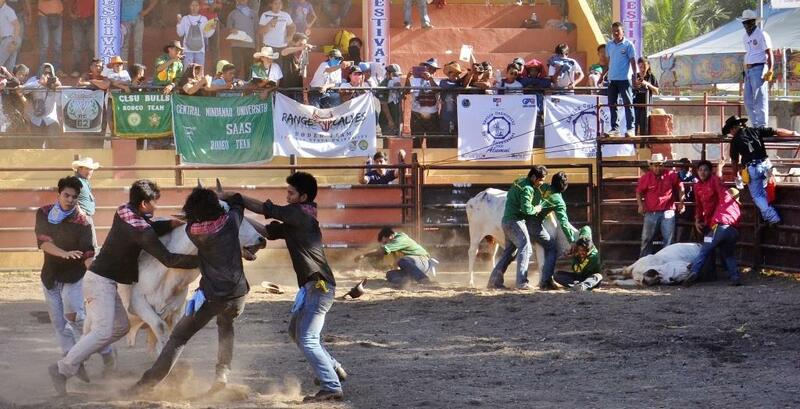 About 120 cattle from the city center are released and are herded by cowboys on the city streets towards the arena. I have called this in the past “Fun Run ng Mga Baka”. Some friends have likened it to the “Running of the Bulls in Pamplona, Spain. 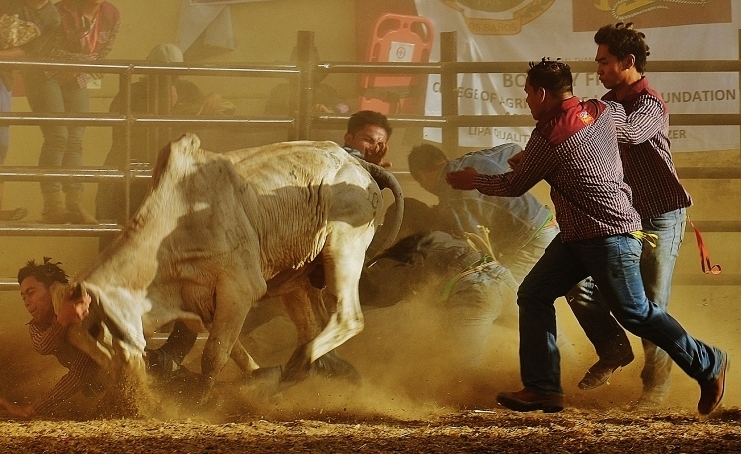 Rodeo Masbateno, Inc also hosts the Rodeo Festival, scheduled April 12-17 this year (2016). In photo is the Cattle Drive which ushers the start of the rodeo season. The events will keep you riveted. Bring your cameras and click away. 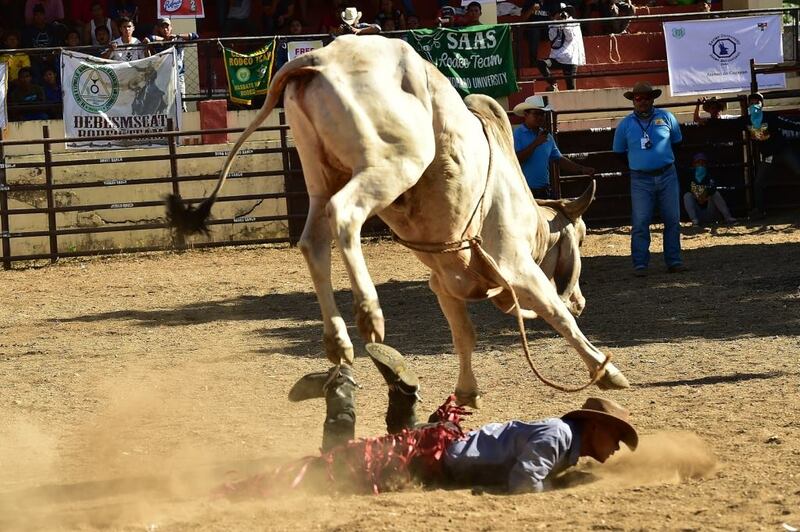 To some people, the most awaited event is Bull Riding. In here, cowboys mount the bull from inside a pen, and need to be on top and riding the bull as it is released. It takes 8 seconds to qualify, and yet majority actually fall on the first second or so. Those who make it are scored based on how they rode the bull, how they held their hats on the other hand, and how they managed the bull. It is a show, a spectacle. Another event some people find as their favorite is the carambola. It can be a 2-man carambola, a 4-man carambola. There is also a women’s division. Carambola is played with two teams of competing cowboys chasing 2 cows on the arena. The first team that grabs a cattle by the neck “owns” the cattle and they just need to bring the cattle down and tie the cattle’s feet. If the cattle is unable to rise after 10 seconds, it is ruled as a good play. Participants compete for the best time. There is also casting down. Teams lasso the cattle and then throw a lasso around its torso so they can pull and cast the cattle down, and tie its feet. There are also lassoing events. Either in foot, or on horseback. 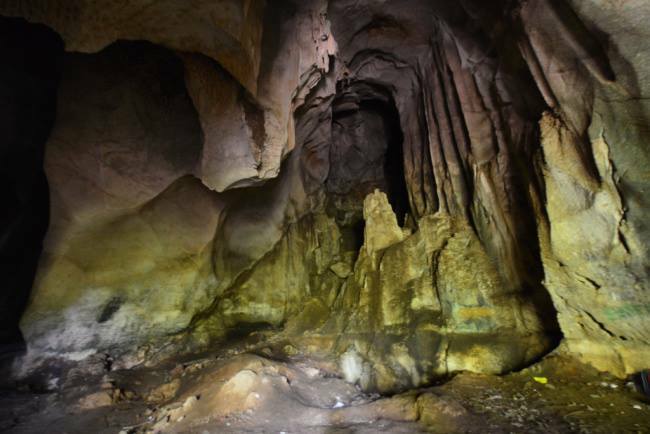 The events are officiated by members of VROoM, the Volunteer Rodeo Officials of Masbate, and mounted by the Rodeo Masbateno, Inc., supported by the provincial and city governments of Masbate as well as the private sector. National Rodeo Director Leo Gozum, extreme right. 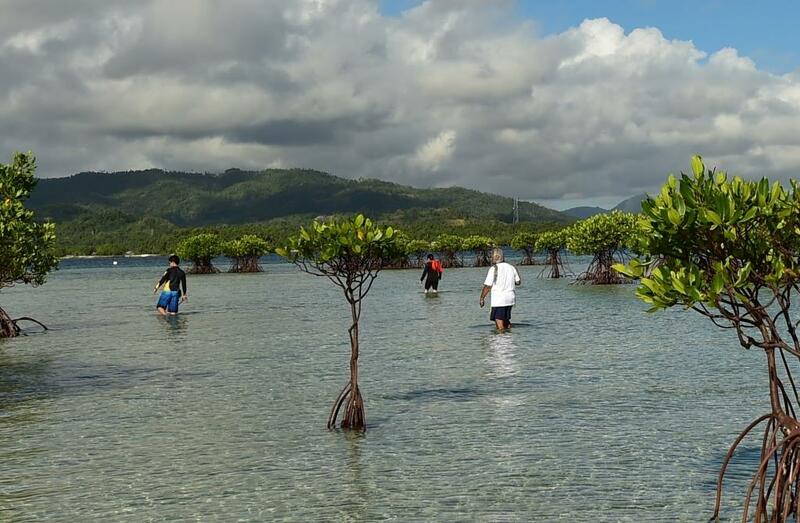 Buntod Reef. 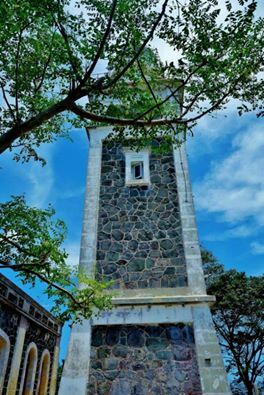 Within Masbate City. Get your gears ready. Pack your summer shirts and shorts, swimwear, and cameras. Book early. And be at the most exciting festival there is in the Philippines. 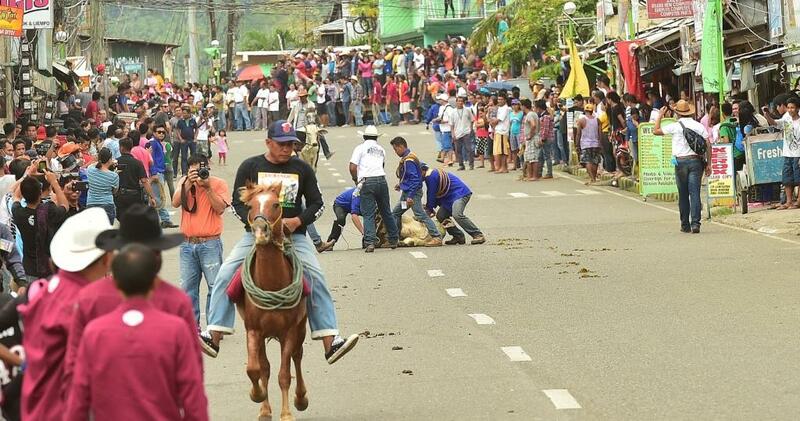 The Masbate Rodeo festival. April 12-17, 2016. 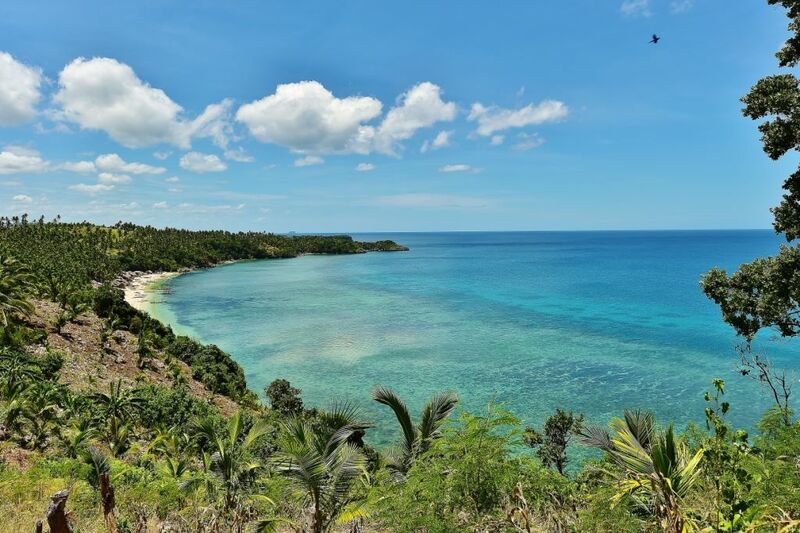 Masbate is the venue for the Grand National Rodeo Finals, with cowboys and cowgirls from all over the Philippines competing. 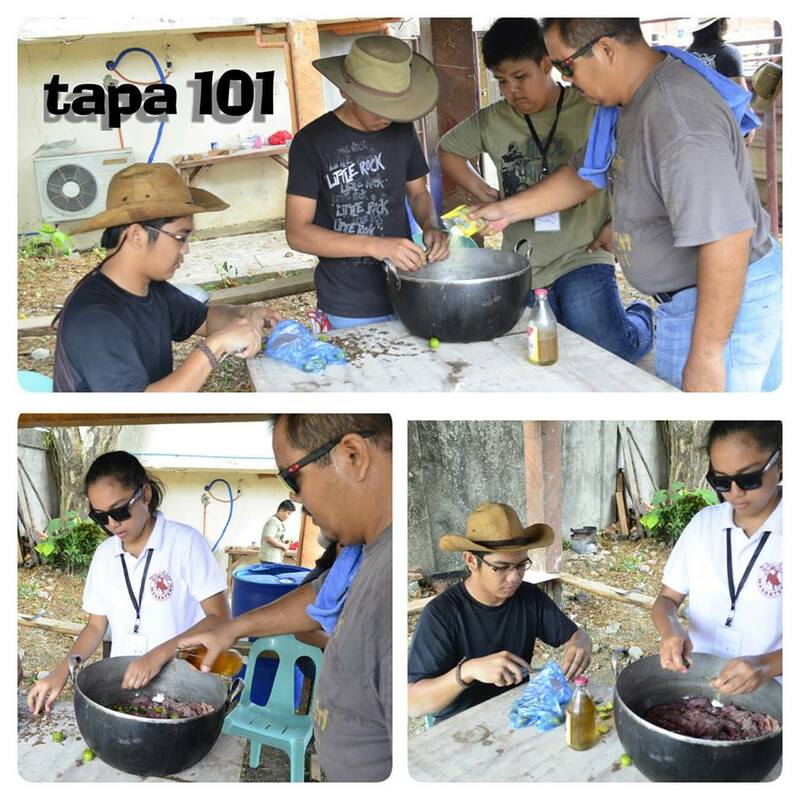 Participants are students taking up Animal Science, or Veterinary Medicine, or Animal Husbandry etc. Professional cowboys from the different cattle ranches around the country compete in the professional category. Events include bull riding, carambola, lassoing, etc. I have been attending the event since 2013. This year was my third. 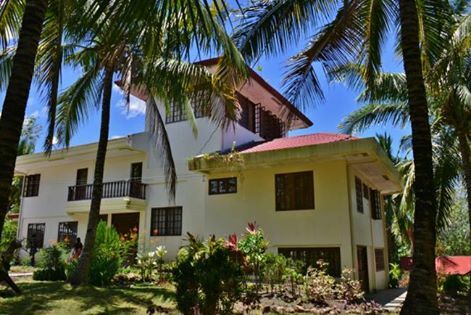 Last year, I stayed in a hotel reputed to be the best — – even President Aquino was supposed to have stayed there when the search and rescue operation for Secretary Robredo was being done. I found that hotel inadequate, and actually lacked proper sanitation. The lavatory was leaking, and from indications it has been forever leaking and not being fixed. A very dirty rug was placed underneath to keep the water from spreading throughout the toilet floor. Wet and dirty turned out to be smelly. Thus, the search for my Year 3 hotel. 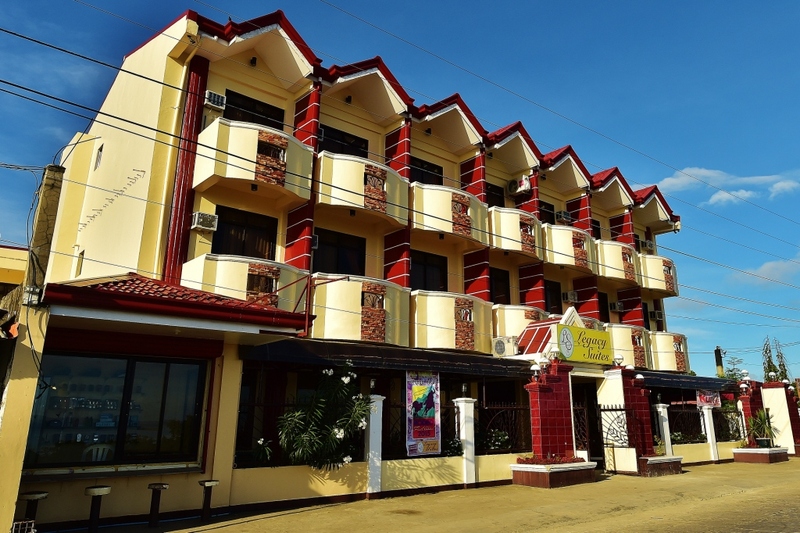 I saw Legacy Suites last year when my FUNtastic Philippines Fun Group friends and I were having a bulalo dinner at the Boulevard by the Circumferential Road. It looked good, and I thought getting a room facing the ocean would be a good idea. The hotel faces the ocean. Early this year, I googled the hotel, looked at the photos of the rooms, and saw their contact details. 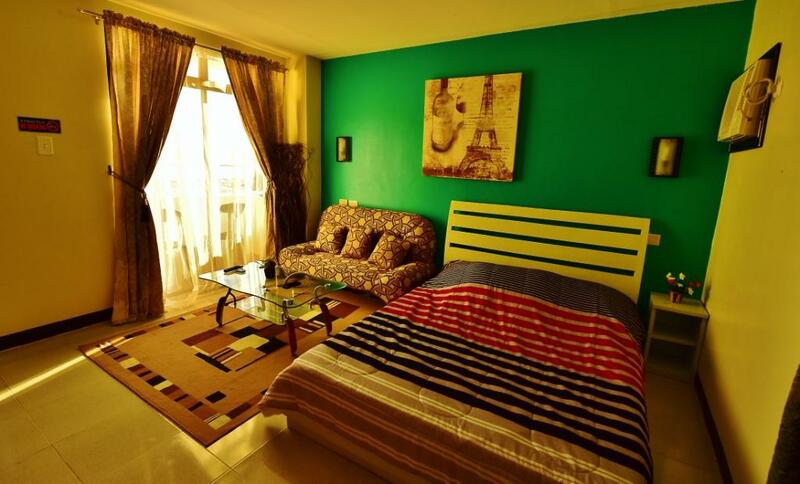 They have single rooms and family rooms with 2 big beds. I thought that if they only took away one bed from the family room and added a sofa instead, plus a breakfast table where I could also work on my computer, that would be good. I sent a message through their website asking if my idea of reconfiguring the room would be acceptable. To my pleasant surprise, the lady owner (they are a hands-on husband and wife team) said she will. So I promptly booked the room for the Rodeo week which was 3 months away. I arrived in Masbate April 14 early in the morning. And another pleasant surprise came in: the owner, Basil, was at the airport to pick me up. Had coffee as my luggage was being brought up to my second-floor room. 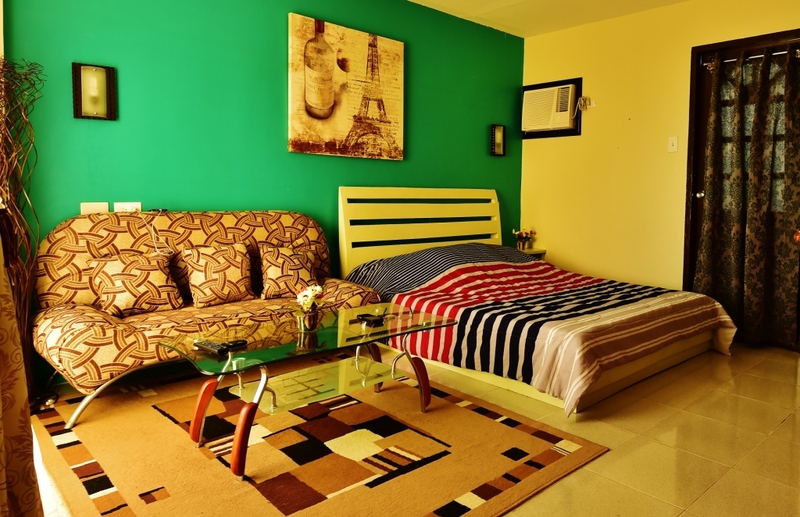 When I went up the room, I was happy to see the room with the sofa and the coffee table. And the room had two verandas, albeit small. One opened to the farm view at the back, the bigger one opened to a view of the ocean. Room 8: my room, reconfigured following my request by email. The rodeo took up most of my days. But I had the occasion to have lunch and dinner at the hotel. Basil, as it turns out, also cooks, and did my fish sinigang lunch and my steamed fish dinner the following day. How hands-on can an owner get? Legacy Suites has a small function room that I figure is booked for meetings and private dinners. My favorite spot is the row of al fresco seats outside the coffee shop, at the front of the hotel. A perfect spot to enjoy coffee. The area is also where the Souvenir Shop stands (at the far end). Realizing I forgot my shades, I was happy to buy one for P500. I checked out after 6 days happy that I had a clean hotel room in a hotel with welcoming and attentive owners and staff. Back in Manila, the lady owner emailed to thank me, and said they are open to suggestions, in case I have some. I suggested that they could build a clothes cabinet – – – my clothes were piled up on top of my luggage on a luggage rack. I also suggested that a solid spring mattress would be more comfortable than the foam mattress I slept in. And some other small details. I figure the owners would heed my request, if my requests prior to my first stay is an indication. 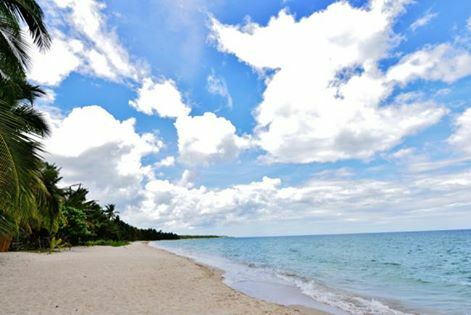 And Legacy Suites will then be the undisputed best hotel in Masbate when that happens. 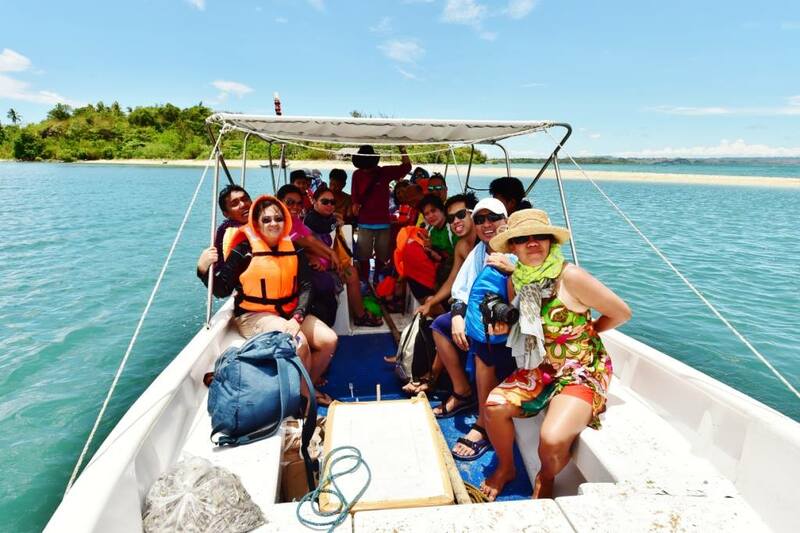 My third Rodeo trip to Masbate. This is addicting. Masbate, I mean – – – not just the rodeo. 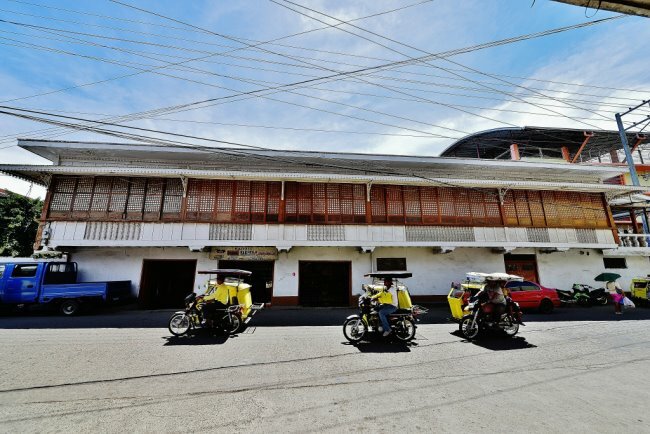 For starters, I have become a member of VROoM, the Volunteer Rodeo Officers of Masbate, the implementing arm of Rodeo Masbateno, Inc. VROoM men and women are on the ground, at the arena, running the events as jusges, timers, stockyard managers, tabulators, etc. I have been designated as timer for Rodeo 2015, a duty I failed to perform due to a doctor’s order for me to stay out of the sun for hours. 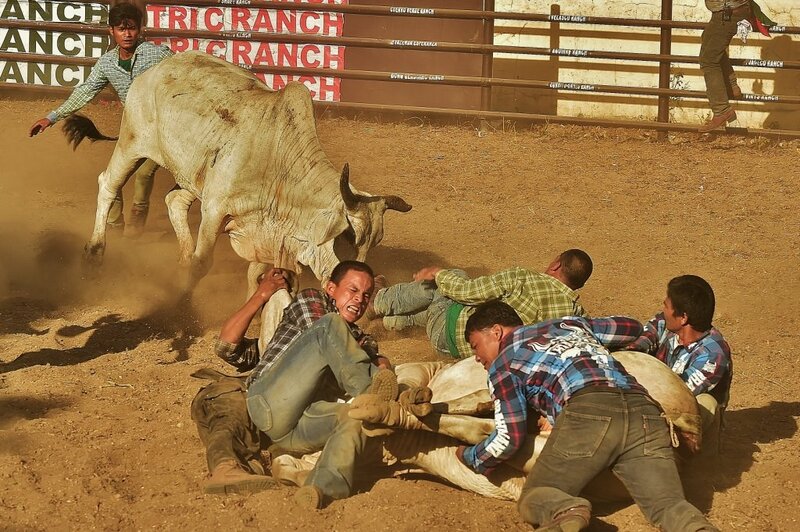 A cowboy must stay on top of the bull for 8 seconds to qualify. Very vew do. And all of them eventually fall off the bull. 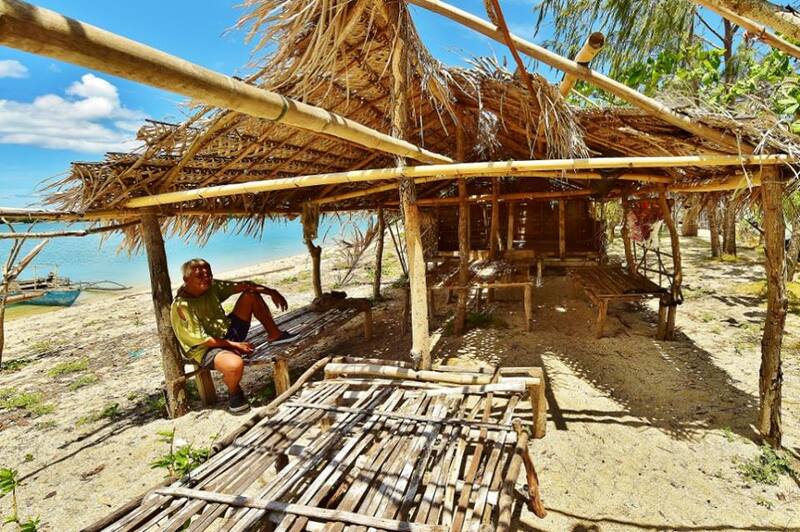 Secondly, every trip to Masbate is a discovery of some new place. And a return to familiar places that one would not want to miss when in town. 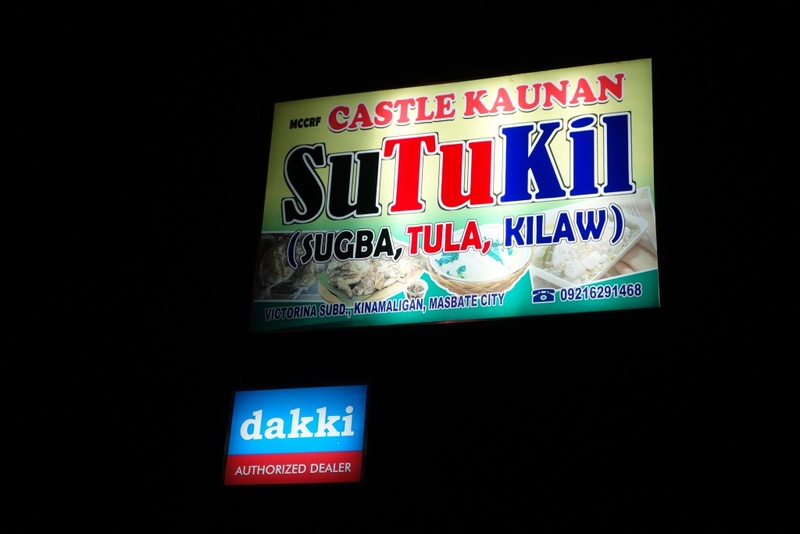 Like the Buntod Marine Sanctuary and SUTUKIL, that restaurant I blogged about for having delicious food at unbelievably low prices. The Masbatenos have become friends. I am invited to the brainstorm for Rodeo 2015. And as I write this, cowboys from Masbate are on the road, coming to my Tagaytay home to wish me happy birthday. And participate in a canao I planned for tomorrow. 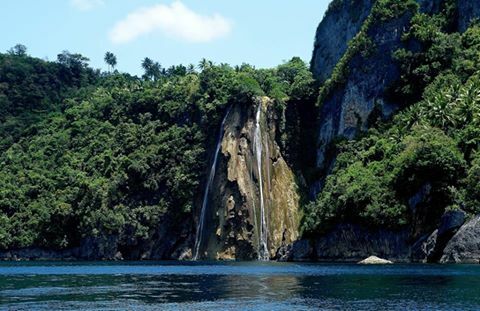 Masbate will make you want to visit, again and again.